She is Fran Pavley, 67, a state senator from the San Fernando Valley who is in the final months of a distinguished legislative career that established her as the mother of California climate change policy. He is Eduardo Garcia, 39, a first-time assemblyman from a working-class Coachella Valley family known for a relentless focus on the needs of his constituents, not environmental causes. Their fledgling alliance—over the last year they have been co-authoring each other’s legislation—embodies two tricky transitions in the building. One involves a shift in personnel, as older environmentalists and legislative champions age out of leadership and are replaced by younger leaders. The other, related transition involves a shift in focus, from greenhouse gases to the impact of climate change—and measures to combat it—on people and specific places. California is now halfway through its second decade of pursuing path-breaking climate legislation. And since this struggle is long-term—and far longer than term limits or the attention spans of Californians—those who worry about climate change also must reckon with the state’s political, demographic, and other kinds of change. It’s been a decade now since Pavley authored AB 32, the nation’s first cap on greenhouse gas pollution, and 15 years since she authored AB 1493, which became the model for national vehicle emissions standards. So the coalition she helped build for those landmarks—a coalition that went beyond environmentalists to include scientists, water agencies, local governments, labor unions, religious institutions, and Hollywood celebrities—has needed updating to better represent the California of 2016—more working-class, more Latino, and more inland. But the sprawl and diversity of the state, in combination with the success of climate change legislation in creating new businesses and industries in California, have made coalition-building harder. There are more constituents for climate change legislation, and thus higher expectations. And that has forced climate legislation to do more than mandate reductions in greenhouse gases; representatives of the state’s poorer, inland places are demanding that regulations and programs improve public health and create job opportunities in their communities. Garcia has been particularly insistent on bringing the benefits of climate investments to his massive desert district in California’s southeast corner, bordering both Mexico and Arizona. 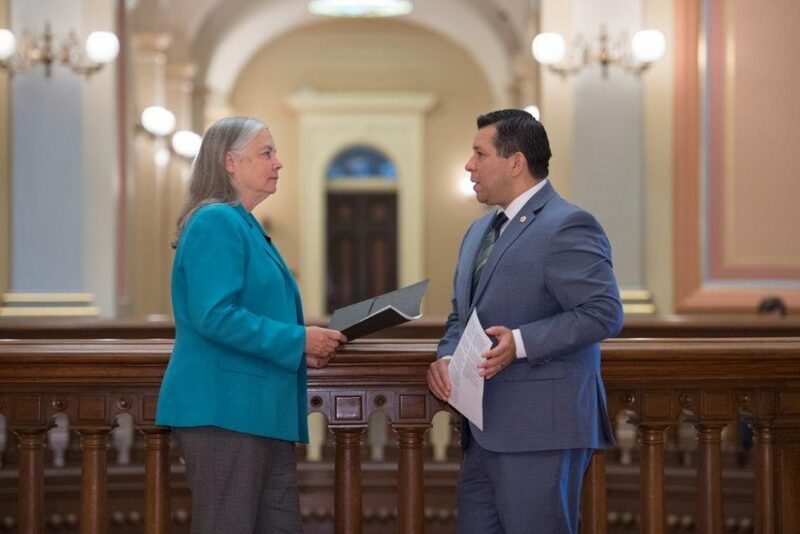 So, after consulting with Democratic leaders, Pavley forged a close partnership with the assemblyman, who quickly became her co-author on major bills, including SB 32, the highest-profile legislation of the session that concludes August 31. His own story supports the narrative of the broader coalition. He is a lifelong resident of the Coachella Valley, a product of a family that includes farmworkers, and a graduate of Coachella Valley High with degrees from UC Riverside and USC. But the partnership is also based on what Garcia and Pavley have in common. … climate legislation [now has] to do more than mandate reductions in greenhouse gases; representatives of the state’s poorer, inland places are demanding that regulations and programs improve public health and create job opportunities in their communities. While Bay Area environmentalists often have the loudest voices and biggest ideas on climate, the climate cause has made progress because of the work of people whose feet actually touch the ground. And Pavley and Garcia are both unfussy, practical Southern Californians who are good at listening and at legislative details. Garcia broke unofficial records by getting 16 bills and resolutions signed in his first year, many of them complicated technical fixes of existing laws. Garcia and Pavley also have taken similar paths to politics, albeit a quarter-century apart. Both grew up in the places they represent, both worked as teachers (Pavley jokes that her transition from middle school to the Capitol was seamless), and both rose through local government. Pavley was elected mayor of Agoura Hills at age 32, in 1982. Garcia became mayor of the city of Coachella at age 29, in 2006. “Eduardo and Fran are the perfect transition,” says State Assembly Speaker Anthony Rendon, who suggested Pavley work with Garcia. The speaker describes visiting Garcia twice in the desert and being driven around the district, as the assemblyman offered detailed descriptions of the history and needs of even the smallest parks. Rendon recalls the partnership coming together at the Paris climate talks in December, when Garcia was added to a California delegation that included Gov. Jerry Brown, legislative leaders, and Pavley. Garcia brought his wife and very young daughter and impressed the older delegates by eschewing sightseeing for intensive work. Garcia later said he was impressed by how other countries, particularly in Europe, are focusing climate change investments on poorer communities and he returned determined to shift California policy in a similar direction. On a recent Friday, I shuttled between the two halves of the alliance. At her district office in Calabasas, Pavley walked me through the evolution of the climate movement in the state. She is termed out of the legislature at the end of the year, and made clear that she sees Garcia as a promising successor on climate change. I met Garcia—the rumpled, stocky picture of the multitasking Gen X professional/father—in a restaurant near the Burbank airport. He was traveling without aides, and mixed a casual bearing with an intense intelligence. We shifted between looking at smartphone video of his preteen son shooting basketballs and his detailed description of the solar potential of Blythe and how brine from the Salton Sea can be turned into lithium for electric vehicle batteries. In these closing days of the legislative session, Pavley and Garcia say they are focused on keeping lines of communication open within their broader coalition—and between members of the Assembly and Senate, whose leaders, Rendon and the Senate pro tem Kevin De Leon, both are considered leaders on the issue. They are pushing hard for SB 32, which extends the greenhouse gas reduction targets to 2030, and AB 197, which creates oversight of state climate programs to make sure their benefits help the economies and public health of poorer and more polluted communities. If these bills become law, give credit not just to the governor and legislative leaders, but also to Eduardo and Mrs. Pavley. *Photo courtesy of Timm Herdt/Office of Senator Fran Pavley.